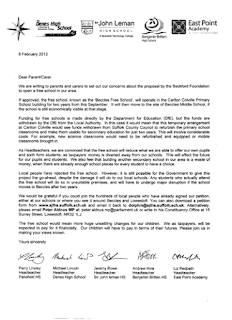 The Headteachers of five Suffolk Secondary schools close to Beccles - Pakefield High, The Denes High School, Sir John Leman High School, Benjamin Britten High School and East Point Academy - have written a letter to parents expressing concern at the proposal by the Seckford Foundation to open a Free School in Beccles. As Headteachers, we are convinced that the free school will reduce what we are able to offer our own pupils and sixth form students as taxpayers' money is diverted away from our schools. This will affect the future for our pupils and students. We also feel that building anther secondary school in our area is a waste of money, when there are already enough school places for every student to have a choice. 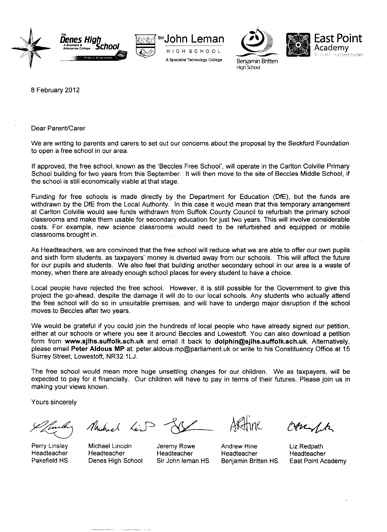 The letter goes on to ask parents to sign a petition against the free school that is available to download on the Sir John Leman High School website. 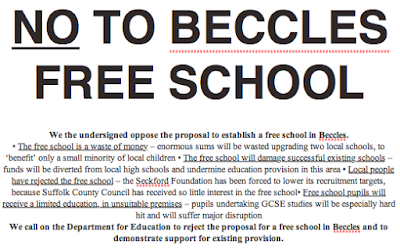 I urge as many people as possible to make their views about the free school known to Peter Aldous MP at: peter.aldous.mp@parliament.uk or in writing to 15 Surrey Street, Lowestoft, NR32 1LJ, and to consider signing our petition against it. Two secondary schools in our small town would have a huge impact on what we are able to do for our students. Please have your say; and let us hope our views will be listened to. My personal views are made clear on Twitter @lemanhead. Finally, many thanks to Councillor Mark Bee, Leader of Suffolk County Council, who had the integrity to back Sir John Leman High School, and our students, by signing our petition. Political parties have united in their opposition to the free school. It really does seem to be hard to find anybody in North Suffolk supporting this Free School and with growing opposition from both politicians and parents I wonder if the Seckford Foundation will decide to cut their losses and abandon the Beccles Free School altogether.